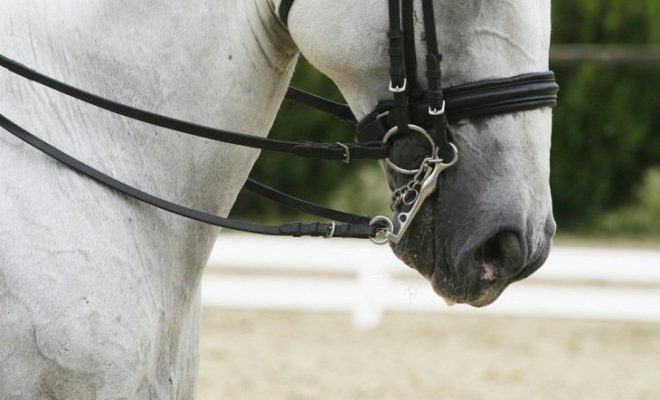 Every dressage rider’s ultimate goal is to have their horse working in self-carriage in collection. However, at every stage of your horse’s training, the horse should be in some degree of self-carriage. So, what is self-carriage and how can you encourage your horse to work in this way? Self-carriage means that the horse should be able to maintain his frame, rhythm, and balance without the rider having to use the aids every stride in order to support the horse. For self-carriage to be possible, the rider must be able to ride using passive aids, allowing the horse to move independently from the rider’s hand or leg. Only then can the rider use the aids to change the horse and/or make it better. In a nutshell, self-carriage enables you to leave the horse alone for a few strides so he can carry himself, rather than you having to micro-manage each stride. It’s important to mention that there is no ‘push here for self-carriage’ and that true self-carriage is only achieved through systematic training and strength building. Young and novice horses will find working in self-carriage very difficult and may only achieve it for a few strides. As you both move up the levels, the degree of self-carriage that your horse will be able to achieve should improve as he develops his strength, balance, and ability to carry more of his weight on his hind legs. Therefore, don’t expect instant self-carriage in the early stages of your horse’s training. For true self-carriage to occur, the horse must first learn to use his neck and body to form a connection. The horse must stretch forward through an arched, basculing neck and connect to the bit. Simultaneously, the horse must remain in balance, carrying himself by engaging his hindquarters and taking more weight behind. This lifts and lightens the horse’s forehand, improving his balance and allowing him to work in self-carriage. The best way to develop stretch is to work on a large circle. Gradually lengthen your reins and see if the horse will extend his neck forward and downward. You will notice that the neck fills out and becomes wider as you look down. But how do you know if the horse is genuinely stretching? If the horse’s neck appears to be flattened, he will be leaning on your hands and falling onto his forehand. Also, the horse probably was not bending and lifting his rib cage properly before the stretch. Correct this fault by spiraling in and out again on the circle so that you establish more suppleness and bend through the horse’s rib cage. Be sure to keep your outside leg on to prevent the quarters from slipping out. Your aim is to ask the horse to bend and stay on one track. If the horse is on his forehand, make sure he is not losing his balance and increasing the tempo of the rhythm. You may have to help the horse by using half-halts to re-balance him. Try to allow the neck to grow longer and then down at the end of the stretch. That way, the horse will have to hold his neck in front of his withers. When the horse begins to bascule, shorten your reins, and ride the horse forward and up to your hand. Use plenty of half-halts with a small “give” afterward as the horse gets rounder progressively and lighter but still stretches for the bit. When you have achieved this positive tension over the horse’s topline, his back will swing underneath you, and you will be able to sit comfortably to the trot. That means that the stretch you’re looking for is genuine and goes through the horse’s whole body, allowing the suppleness and engagement required for self-carriage to develop. Once the horse is working correctly through his back to the bit, you can begin to work on engaging the hindquarters. To create the carrying power you need to allow self-carriage, the horse must step under himself more, lower his croup, and raise his withers. Here’s how to develop the engagement you need for self-carriage. Work on changing the horse’s stride length in trot, using the half-halt. Vary the stride length on straight lines and circles too. Ride the same exercise in the canter. 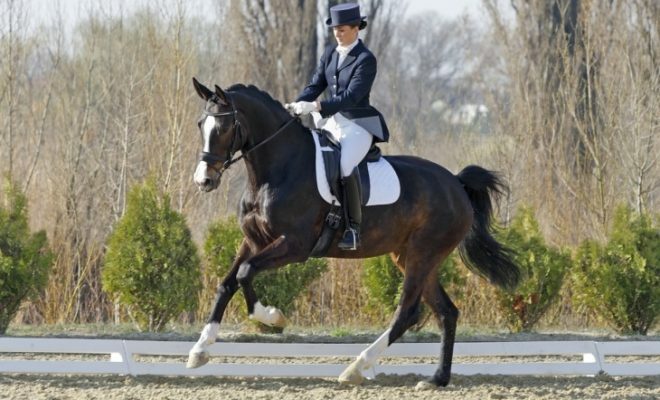 Ride plenty of transitions, especially canter-trot-canter and canter-walk-canter. 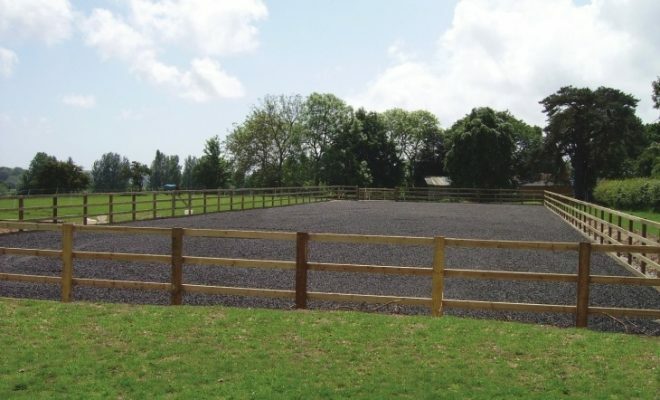 That will help to strengthen the horse, improving cadence and developing the topline. Ride transitions through lateral exercises, i.e., in shoulder-in or half-pass. Use rein-back to correct a horse that tends to trail his hind legs. A good rein-back will raise the horse’s withers, chest, and rib cage, engaging both hind legs and lifting the pelvis. Throughout your schooling sessions, you should check that your horse is working in self-carriage. 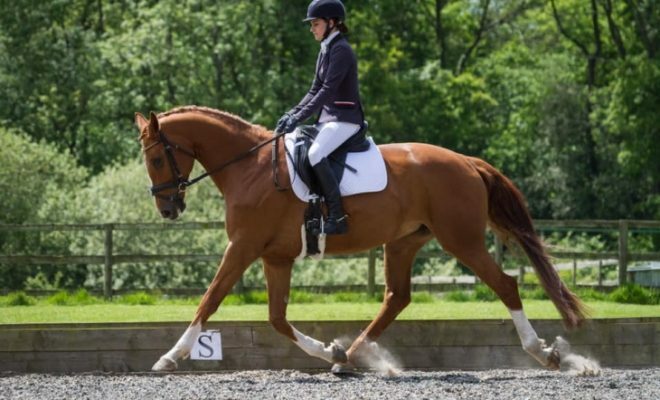 If you compete in dressage classes from novice level upward, you’ll be familiar with the give and retake of reins exercise, as it’s included in many dressage tests. The give and retake of reins is asked for in dressage tests specifically to allow the judge to see if the horse is working in self-carriage. 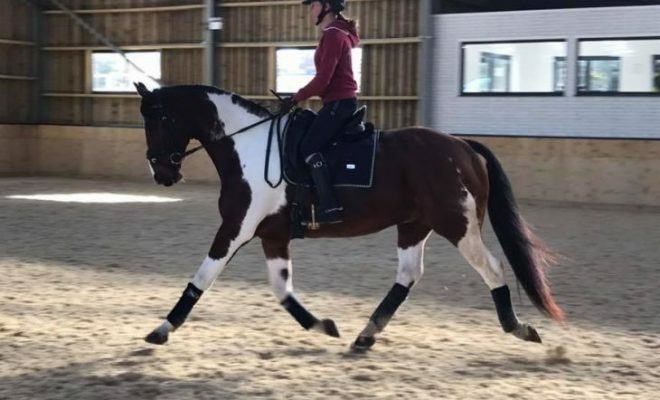 Ride a circle in working trot, and when you’re confident that your horse is working through his back and has his hocks well underneath himself, release your contact on the reins for a stride or two. The horse’s outline, rhythm, and balance should not change. Repeat the exercise in the canter. True self-carriage is achieved through the development of the horse’s ability to work over his topline without tension to the bit. Once you have established that, you can use the half-halt to bring the horse’s hindquarters more underneath his body to lighten the forehand. A horse that is working in true self-carriage will quickly progress through the levels and will gain excellent marks in dressage tests. If you have any tips, questions, or experiences that you’d like to share with us, please pop them in the comments below. What Does It Take To Get To Grand Prix in Dressage?